Besides these programmes, protest demonstrations also marked the day seeking a rehabilitation policy, education institutions, special recruitment drive and monthly pension etc for the physically challenged persons. Shouting anti-Government slogans for its failure to protect the rights of the disabled persons, hundreds of disabled persons marched in Residency Road Srinagar and police foiled their march and detained several of them. The protesting physically challenged persons said they have no access to opportunities like education, employment and other civil and political rights. 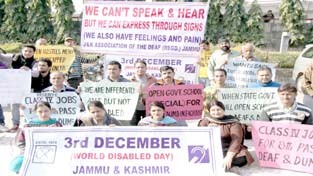 Hundreds of disabled persons under banners of Jammu and Kashmir Handicapped Association (JKHA), Humanity Welfare Organization (HWO), All Jammu and Kashmir Association of the Deaf (AJKAD), Jammu and Kashmir State Welfare Association for the Blind (JK SWAB) and Voluntary Medicare Society (VMS) carried out the protest march. Students of Shafaqat Special School and Patients with Spinal Injuries also participated in the day long rallies along with prominent Doctors and Para Medical Staff. In Jammu also, a protest demonstration was organized by J&K Association of Deaf in front of the Press Club Jammu. 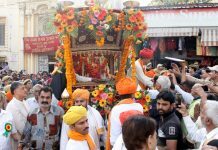 The protesters, led by the Association president Vijay Gupta raised slogans in support of their demands and later submitted a memorandum to the Government. They demanded that the facilities like reservation in professional colleges, schools, Braille system, and free higher education should be provided to these students. Reaffirming Government’s determination to create a barrier free environment for the people with disabilities, Minister for Social Welfare, Sakina Itoo, said that an effective mechanism is being evolved for an inclusive survey of the disabled for need based resource allocation and provisions in development schemes. 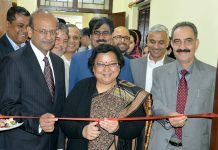 She was speaking at a function in connection with World Disability Day, organized by the National Federation of the Blind at residential school for sightless girls, Roop Nagar. Director Social Welfare, M H Bhatti was the guest of honour on the occasion. Highlighting efforts of the Government envisaging more facilities to the disabled, the Minister said that ramps are being built in various important places besides the matter of reservation for disabled persons in buses is also being taken up with the concerned authorities. State president and general secretary of the Federation, Sanjay Gupta and R D Dubey spoke about the significance of the day besides activities of the school. A cultural bonanza was also presented on the occasion. 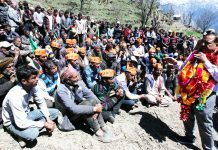 Minister for PHE, Irrigation & Flood Control, Sham Lal Sharma has stressed for more initiatives for the welfare and rehabilitation of physically challenged people so that they can also lead a dignified life. They have equal right to live and progress in the society and this can be possible with the support of all sections, said the Minister, who was speaking at a function organized by the J&K Disabled Welfare Association to mark the World Disability Day at Akhnoor today. He said by only observing the day once in a year will hardly serve any purpose but need of the hour is to do something concrete for the upliftment of disabled persons with collective efforts, he asserted. 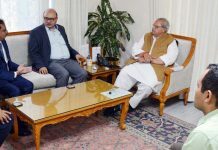 Chairman, J&K Disabled Welfare Association, Akhnoor, Sushil Sharma highlighted the problems of the disabled people and requested the Minister for his personal attention to address these on priority. International Day of Person with Disabilities was observed at auditorium of Women College Gandhi Nagar Jammu. The Event was organized jointly by Nirvana Academy & Disabled Care Foundation in collaboration with NSS unit of GCW Gandhi Nagar and was supported by the Bharti Infratel, Little millennium Playway School & Mindscapes Education & Environmental Trust. 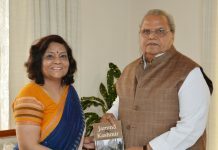 The programme was chaired by Shantumanu Sinha, Divisional Commissioner Jammu, Dr Kiran Bakshi, Principal GCW, Gandhi Nagar along with senior journalist Sohail Kazami and educationist Akhila Sharma were the guest of honour. A colourful multitalented programmes on cultural bonanza was presented by the disabled students of various schools along with Mohd Farooq from Poonch a young talented singer enthralled the audience. The series of the events was divided into two parts. In first session an inter college symposium was organised on the topic Social/Media Responsibilities, Legal Remedies & Political will “ in Bringing National Trust Act 1999 in Jammu & Kashmir”. A seminar was organized by Help age India in the premises of Jammu College of Physiotherapy here today. On the occasion, awareness was imparted regarding disability among elderly and the kind of help and support that can be rendered by physiotherapy to help them cope up with their disability. The team comprising of Dr Mairaj Muzaffar- State Physiotherapy Coordinator and Parshotam, Helpline Councilor threw light upon various aspects of disability and problems faced by them. 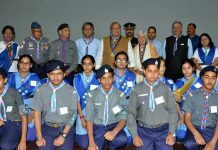 Satish Sharma, president LYC Jammu – Poonch, observed the World Disability Day with the differently abled children of Jammu Red Cross Home at Manda Wild Life on Tuesday. On the occasion Mr Sharma voiced for the rights of differently abled children and demanded that Government should make the system handicapped friendly and people should get all these rights as enshrined in United Nation’s Convention on the rights of Handicapped people. 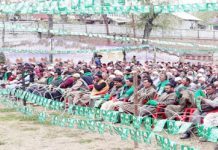 A program was organised By Social Royal Voluntary Environmental Service (SRVES), a Socio environmental faction here at its Head quarters in the capital cities. On this occasion CEO SRVES Er Mirza Idrees Ul Haq said that as per Census 2001, there are 302,670 persons with disabilities in J&K. More shocking is that less than 2 percent of persons with disabilities are educated and less than 1 percent are having employment. There is no evidence of school for blind, speech disabled and hearing disabled people in J&K, he lamented. M C Khalsa College of Education observed World Disabled Day under the series of “International Volunteers Week”. The programme started with a pledge by the students to voluntarily serve the needy and disabled people throughout the year. A detailed and informative powerpoint presentation on different category of disabled children, their needs and the preventive measures to be taken was given by Dr Madhu Singh, Principal of the college. NSS volunteers performed a skit to show the contribution of the people in bringing disabled children in mainstream. Education Department of Udhampur District organized a rally to commemorate the World Disability Day. 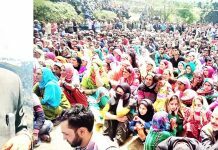 A large number of the students of Government and private institutions took out a rally, which was flagged off by the Deputy Commissioner Yasha Mudgell. Students were raising slogans to provide assistance to this neglected section of the society and make them self dependent. 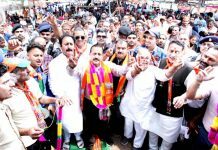 The rally after passing through the main markets, Dhar road, Salathia Chowk, Court road, Mukerjee Bazar, Goal Market and Dabber Chowk, calumniated at Mini Stadium Udhampur. Several impressive but simple functions were held across the Valley in connection with International Day for Disabled today. Composite Regional Centre Campus, Bemina organised a day long programme to observe the day. Among others the programme was attended by the officers, intellectuals, social activists, students and their parents. The speakers on the occasion highlighted the role of society in the rehabilitation of differently abled persons so that they can live a dignified life and contribute towards the welfare of society. District Administration Baramulla in collaboration with HOPE Disability Centre organised Disability Day at Baramulla. The speakers highlighted various issues related with the disabled and spoke about various schemes under implementation for the special class of the society.